“The mall” attracts flocks of customers young and old to one sprawling, often crowded location for a centralized experience of shopping, dining, and entertainment. What could go wrong? Sure the mall is fun, but it’s also loaded with variables around every turn that have the potential to cause injuries related to slipping and falling on the premises. These unfortunate situations also raise many legal questions concerning the various commercial parties who may be responsible when visitors are seriously hurt. 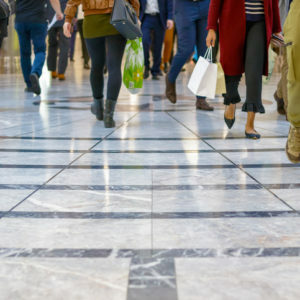 The Salamati Law Firm helps those who have have slipped or tripped and fallen in shopping centers, malls, movie complexes, and sustained a serious injury. We have a passion for helping negligence victims across the state of California get back on their feet and recover damages for their ordeal. Who is liable for injuries sustained in a shopping mall? California imposes a duty on property owners to take reasonable steps to make the premises safe for those who enter it. This usually means keeping the property in safe condition and warning of dangers that the owner or occupier actually does know about or reasonably should know about. Failing to do either of these may create liability for resulting injuries. Your personal injury lawyer will review the facts to determine whether any of these, or even another party, may be liable for injury. The injured customer needs to be able to identify that the defendant failed to take reasonable steps to make the premises safe or warn of a defect. This could mean showing that the defendant placed the hazard or even failed to perform the inspections that would have prevented an accident. For example, if mall security cameras prove that a spilled beverage sat on the floor for several hours but no employees inspected the area or cleaned the spill, the mall could be liable when someone slips on it. Not all slips and falls in a shopping center mean the businesses are liable.Say your fall was caused by a clumsy fellow customer – the property owner or occupier likely is not liable (though the customer might be). If your own negligence was partly to blame for the fall, you may still pursue a claim against the property owner for their breach of duty but any award may be reduced in proportion to your own fault. All of these arguments have the potential to be hotly contested all the way up through trial. It is important to gather credible testimony and documentation of the condition that caused the fall and how or why it existed. You will also need evidence of losses caused by the injury. Contact information of any witnesses – independent witnesses are best! In California, an injured party only has two years to file a personal injury lawsuit. That may seem like a long time but many people try to wait until they are completely healed to file a claim and that can be disastrous. It may take much longer than two years to be fully healed and waiting beyond that point may render the claim invalid if your reason for delay is not covered by some exception to the rule. Do not take unnecessary risks with your claim. Speak with Los Angeles slip and fall lawyer Sean Salamati to be sure you have all of the information you need to establish who is to blame for your fall and to receive full compensation to make you whole. We know the system and fight tirelessly for the rights of injury victims across California. Call today to schedule a free consultation.